It's no secret to readers of this blog that I recently became obsessed with knitting Korknisses. Seriously, wish I was knitting some right now rather than sitting at the computer. :) Love those little guys. Anyway, it's getting to the point where I am saving every wine cork I can get my hands on, and have had friends give me a cork or two. 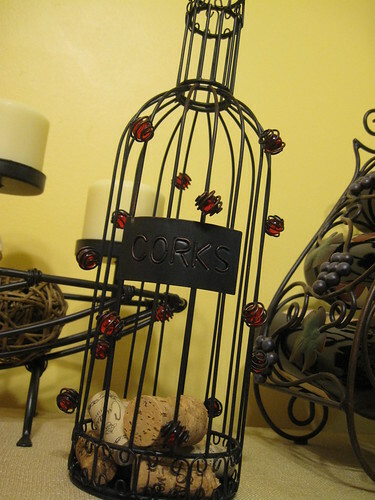 So when my MIL received a cork cage from my SIL for her birthday in November I dropped some serious hints that I would like one for Christmas. I was quite happy that my hinting paid off. 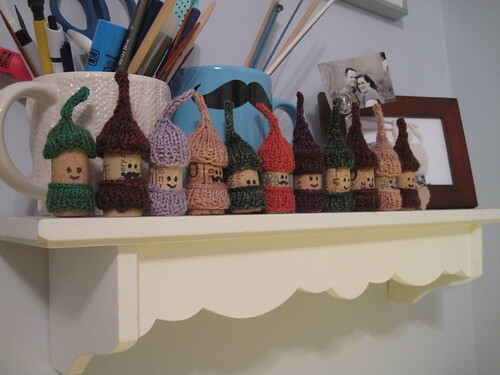 It's cute, it's practical for the woman weirdly obsessed with knitting cork people and looks quite good in our kitchen. It sure beats the plastic bag shoved in a drawer, which is how they were being stored before.